With a complimentary breakfast an outdoor pool and rooms with microwaves mini-fridges and free Wi-Fi La Quinta Inn & Suites Plantation at Southwest 6th Street provides good value at a location near the area's most popular attractions. The four-story hotel offers 104 rooms with microwaves mini-fridges coffeemakers TVs with expanded cable channels and Nintendo games. Non-smoking rooms may be requested. Surf the internet from the comfort of your room with free Wi-Fi. Save your cell phone minutes; local calls are free. The complimentary breakfast features everyone's favorite â?? hot waffles. Soak in some sunshine while splashing in the outdoor pool or work up a sweat in the fitness room. Parking is free. Pets are permitted with some restrictions. The hotel is eight miles from the sunny beaches of Fort Lauderdale. Pick up a new swimsuit or a beach towel at the Broward Mall adjacent to the hotel or The Fountains a half-mile away. There are lots of dining options to choose from within a half-mile of the hotel. Golfers can hone their swings at Plantation Preserve Golf Course or Jacaranda Golf Club both less than a mile away. Cheer on the Dolphins at Sun Life Stadium 15 miles away or catch a cruise at the Fort Lauderdale cruise terminals eight miles away. 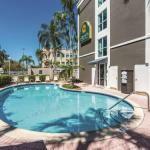 The hotel is 12 miles from Fort Lauderdale International Airport. A dog up to 25 pounds is allowed. There is a $10 per night additional pet fee. They prefer that dogs are not left alone in the rooms, but if you must go for a short time, a contact number must be left with the front desk. Dogs must be leashed and cleaned up after.